For cold weather conditions in a garage down to 34 ℉ (1 ℃), it is recommended to install an inexpensive Garage Refrigerator Kit. Electrolux & Frigidaire makes an inexpensive Garage Refrigerator Kit. This kit is easy to install and fits many Frigidaire and Kenmore appliances. It seems this is the only kit available on the market, however it may be adaptable to other brands as well. The kit includes a small heater with adhesive backing that when installed tricks the thermostat into running your compressor so your freezer items stay frozen. This Garage Fridge Kit is designed to work with top-mount models (freezer on top) manufactured since 2001. Safety Notice: Be sure to disconnect the appliance prior to performing any procedures. If you are uncomfortable working with electrical items or the upgrade recommended, please contact your local service provider for assistance. Be cautious of sharp edges that may be present inside the appliance that could cut or injure yourself or others. The small Frigidaire kits are quite easy to install. Remove the control box in the fresh food compartment. That’s the kit’s installation instructions in a nutshell. Click this link to download and review the Electrolux/Frigidaire Garage Refrigerator Kit Manual PN 241532101. Where do I buy a Garage Fridge Kit? You can buy the kits at local appliance part warehouses or online here. 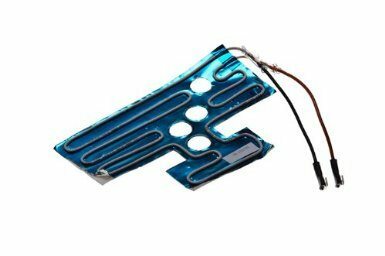 Do I need a Band Crankcase Heater? When using a refrigerator in an uninsulated garage where freezing temperatures are experienced, you may also need a band crankcase heater on the compressor for proper operation. The freon in the system needs to remain in a gas form. When the compressor gets very cold, the freon in the system will revert back to a liquid. The compressor is not designed to run with liquid in it and can only pump and compress a gas. Adding a crankcase heater will make sure the freon remains a gas in the compressor and it can run anytime. Where do I buy a Crankcase Heater? You can buy a crankcase heater at a local appliance or HVAC parts business or click here.